This Green Protein Power Breakfast Smoothie is the perfect morning pick-me-up to get the day started off right. The mix of natural sugars, vitamins, and minerals from the banana + mango + spinach combo really help to perk you up while the healthy fats and protein from the pumpkin seeds and hemp hearts keep you feeling satiated. I used to be a total oatmeal girl when it came to breakfast. If you follow Garden of Vegan on tumblr, you might remember that I ate oatmeal all the time, like pretty much every single day. While I still love oatmeal, for some reason I just don’t have much of an appetite first thing in the morning anymore. Since skipping breakfast is simply not an option for me (it’s pretty much guaranteed that I’ll be starving and grumpy 2 hours later) green smoothies have become my everyday go-to breakfast. Green smoothies are seriously the perfect early breakfast meal. Not only has this Green Protein Power Breakfast Smoothie saved my breakfasts, they’ve also taken the place of my morning caffeine addiction. I used to drink 1-2 cups of coffee with my breakfast every morning. But now I’ve found that this green smoothie gives me the same sort of boost that caffeine does, without any negative side effects. I absolutely love having a big green smoothie first thing in the morning, it makes me feel awake and energized for the day without the crash a couple of hours later. I mean, how can you not feel good after downing 2+ servings of fruits and vegetables before 10am? Not to mention the loads of wonderful nutrients, vitamins, minerals, and antioxidants. Another awesome thing about green smoothies? They don’t have to be all about fruits and vegetables. Adding other foods like nuts, seeds, and grains creates a smoothie that can hold it’s own as a meal and is truly satisfying. Pumpkin seeds and hemp hearts add a nice boost of protein and fat to this quick and healthy breakfast. Give it a try and see how you feel! This powerful green smoothie is high in calcium, manganese, magnesium, phosphorus, and vitamins A, C, and E.
Almond milk: Unfortified almond milk is a good source of vitamin E & calcium, many varieties are often fortified with vitamins A, D, & B12, riboflavin, & zinc. Mango: High in vitamin C & A and contains moderate amounts of vitamins E, K, B6 & B9 in addition to potassium and copper. Baby spinach: Loaded with vitamin K (1 cup provides over 180% of your recommended daily intake) as well as vitamins A & C.
Pumpkin seeds: Pumpkin seeds are a good source of protein, iron, zinc, manganese, magnesium, phosphorus, copper, and potassium. Clockwise from left: Frozen mango chunks, unsweetened almond milk, baby spinach, banana, hemp hearts, and raw pumpkin seeds. In a blender (or large tumbler if you’re using an immersion blender) layer the spinach, banana, mango, pumpkin seeds, and hemp hearts. Add the almond milk and blend until smooth. I use a cheap 15$ immersion blender and I blend this smoothie for about 2 minutes (long enough to blend the pumpkin seeds really really smooth.) This recipe makes 1 large smoothie (2 cups – 500ml). The Green Protein Power Breakfast Smoothie: before and after blending. 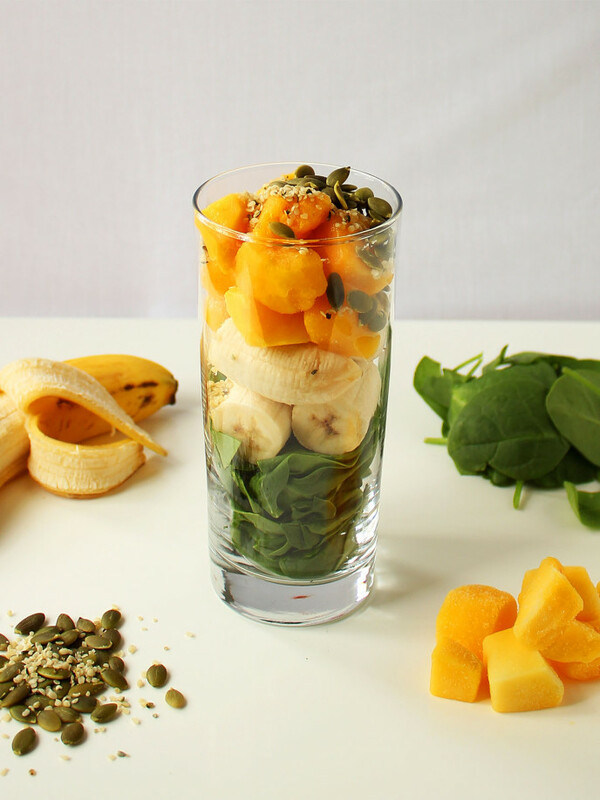 This smoothie provides a big dose of brightly coloured orange and green fruits and vegetables. For a nut free option, substitute the almond milk with a certified nut free oat milk, rice milk, hemp milk, soy milk, or coconut milk. To make a variation of this green smoothie without banana, substitute the banana with 2/3 cup of frozen mango or frozen peaches. As with any smoothie recipe, feel free to experiment with the ingredients. When it comes to smoothies there’s rarely a mistake that you couldn’t fix by playing around with the ratios a little bit. If your smoothie’s too thin, add more frozen fruit. If it’s too thick, add more liquid. If it’s too sweet, add a splash of water. If not sweet enough, blend in a couple of pitted dates or your favourite natural sweetener. Happy blending! Love smoothies? Here are some of our favourites: The Best Green Smoothie, Carrot Sunshine Smoothie, and our PB & Banana Iced Mocha Smoothie. This green smoothie is the perfect morning pick-me-up to get the day started off right. The mix of natural sugars, vitamins, and minerals from the banana + mango + spinach combo really help to perk you up while the healthy fats and protein from the pumpkin seeds and hemp hearts keep you feeling satiated. In a blender (or large tumbler if you’re using an immersion blender) layer the spinach, banana, mango, pumpkin seeds, and hemp hearts. Add the almond milk and blend until the pumpkin seeds are really really smooth. This recipe makes 1 large smoothie (2 cups - 500ml). For a nut free option, substitute the almond milk with a certified nut free oat milk, rice milk, hemp milk, soy milk, or coconut milk.For a higher protein option: Add a scoop of your favourite vanilla protein powder and/or substitute the almond milk with a high protein non-dairy milk such as soy or hemp milk. This smoothie contains approx. 13g of protein when made with almond milk, substituting it with soy milk will add an additional 6g of protein. Adding protein powder will add about 6-15g of protein (depending on the brand and amount of protein powder you use. )To make a variation of this smoothie without banana, substitute the banana with 2/3 cup of frozen mango or frozen peaches. Love these photos with the recipe —really helps motivate me to eat well. Hi Brittany. Beautiful pictures – you really have a knack for capturing the deliciousness of the ingredients. Thanks Christine! What a lovely roundup 🙂 Thanks for including me! I’m still learning how to transition to a Vegan lifestyle. Of all the places I’ve visited on the web, this place is simply put, beautiful. I’m having my firstgreen protein power breakfast smoothie tomorrow morning. Also, the name of this website is easy to remember. Thank you. I’ll be back frequently. Ah, that’s so lovely to hear, thank you Carole! Thank you so much for visiting, I hope you love the smoothie! About how’s many calories are in this smoothie? Oooh! Arugula in a green smoothie, that sounds awesome! Thanks so much Caroll! Wonderful to hear! This smoothie is such a great way to start your day 😀 Thanks for commenting!! I have never made such a delicious smoothie before (and I’ve tried a BUNCH). Plus, it kept me completely full for more than 4 hours. This is my new daily lunch. Thank you! Yaya!! That’s great to hear Ainsley, I’m SO glad you like this smoothie so much 😀 🙂 Thanks for commenting, I REALLY appreciate it!! I’m so happy to hear that Shannon! It’s a wonderfully nutritious breakfast 😀 This smoothie contains approx. 600 calories, 26g of protein, and 10g fibre. Love this recipe Brittany, so much so that I’ve included it in my list of favorite protein smoothie recipes! This looks great! I have a question about combining the nuts/fats/fruits/greens and powder. I read on another site that certain foods are not supposed to be combined because they won’t digest properly. Is that not the case? This looks like a more appetizing smoothie compared to some that just have greens/vegetables/fruit combos. Also, this seems like it would keep you satiated longer. Thanks! Love this smoothie. However I have a question. I have made this my breakfast. But it makes me feel funny. Like my heart is racing But my blood pressure is good. Just wondering why. Cause you’re freakin PUMPED with energy! Great tasting smoothie. However I have to use twice the amount t if almond milk to get it a smoothie texture. This recipe made the perfect smoothie. I have tried so many smoothie recipes and nothing really works for me. This was the first one that I finally loved. I will make it again of course. I added the vanilla protein powder/water that you suggested as optional. Beautiful pictures too. Thank you so much! Made this, this morning and I’m loving it!!! Love this recipe! Could you replace (or add ito it) the spinach with greens powder? I’ve never used greens powder but may be handy to up the veggie punch or if I’m out of natural greens. Any thought? Thanks! Could this be made up into individual portions and frozen? I had my tonsils taken out recently. Smoothies are great for that surgery and this smoothie is full of healthy vitamins and fats that you need on a daily basis. Perfect. I am going to buy the ingredients for this today!! Do you chop your own fruit then freeze it? Or do you by pre frozen mango? Wither works but I used pre-frozen mango! Wow, what an amazing website and looks great. Thank for posting delicious smoothies like this that are actually healthy too.